The Run 4 for the Greenway will pass through College Hill again this year, and what better place could there be to enjoy it than our own Springdale Park. The College Hill Neighborhood Association is sponsoring a party and cheering station at the park between 5 p.m. and 7 p.m. on race day. We hope you’ll make plans to join us. We’ll have more details on the party next week. In the meantime, if you’re a runner, registration for the four-mile race is open at the race homepage. If you’re not up for four miles, there’s also a one-mile run/walk. Volunteers are needed as well; online registration is also at the homepage. If you’d like to volunteer as a course monitor in College Hill, use the “Message” box on the registration form to let them know. Runners will come off the Greenway at Morehead Park and come up into the neighborhood on Spring Garden Street. They’ll turn at Springdale Court, then run up Walker Avenue, turn left onto South Mendenhall, take a right onto Fulton and head back downtown with a left on Spring Garden. 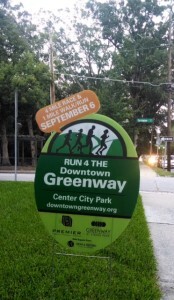 The race is a fund-raiser for the Downtown Greenway Maintenance Endowment. See you on the 6th at Springdale Park. 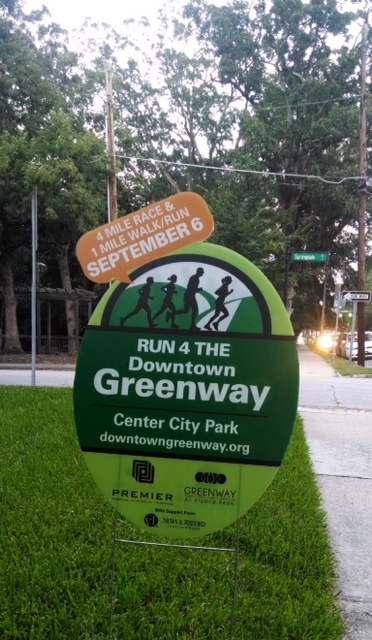 This entry was posted in College Hill Neighborhood Association, Downtown Greenway, Events, Fulton Street, McGee Street, Mendenhall Street, Spring Garden Street, Springdale Park and tagged Run 4 the Greenway, Springdale Park. Bookmark the permalink.